YOYOS.COM.AU • View topic - roll call ! whos going and who are you bringing ? lets get the abbey sorted out and book it early ! I'll be there with a crew to kick in support for our main man, Breaker J. Count me in for the abbey, us SA people should try and get our flights organised - go over as a group kinda thing. Ill be already in sydney (kinda) - so won't fly over with y'all. But am definatly in for flying back. Ill have to make a decision soon about my flights though - and will be flying qantas (uni's paying for my return flight). Let me know when your all arriving cos ill be catching a train down from newcastle and can just meet you all after you arrive. 99.9% I'll be coming to the nats. erm ben, ur jeting just after the comp? Wouldn't mind being back home for the following work week. And leaving sunday arvo means comp friday, hanging out sautrday - and recovering sunday. There has been talk of staying at the abbey - but isn't the location different this year - making it possibly not the best place to stay? 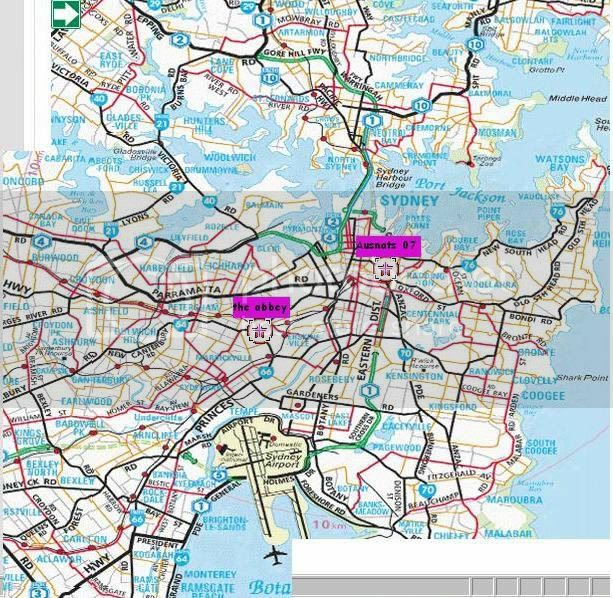 Theres probably tonnes of backpackers' places much closer to the venue - which also means closer to the CBD which is where all the shinanigens will probably ensue after the comp etc. Is it worth chasing down somewhere more appropriate to stay ? well its not that far atall... ill re-post the pic. But yea for all i kno there may be other places, but its not an unfathomable distance to town. Yea - i saw that map and thats what made me thing maybe we could dig up something closer. So whats everyones planns for the weekend ? Will there be stuff happening on saturday and/or sunday ? If nobody's gonna be around i'd like to be able to fly home sooner rather than sitting around sydney bored. What were people thinking ? Skip - when are you going off to visit ppl's ? umm, I'm a little confused, is the comp on friday or the sunday? All the info I can find says its on the sunday. . .but Australia Day is on the Friday. Hey Ben if you can find somewhere closer (and around the same $$ - not too fussed) I may be interested. I don't really mind where I end up staying, but I'd rather stay with/near people I know. Don't really have any strict plans for the weekend, I was just going to go with the flow. Aout flights, I'd rather not leave straight after the comp. I'd probably leave monday or tuesday - depends on home much time I can get off work (their going to love that I'm going to a yoyo comp...hehe). When are some people leaving for Sydney? Tis is getting kinda hard to organise on the forum, maybe we should just meet up sometime and organise it? grrr, this is getting confusing. . .
nightly rates for the abbey is $56 for a double room, with $17 for an extra person. Or there is $280 for a week, if you can stay that long. Somewhere closer would be kinda better (travel costs, but mini bus looks cooland public transport is not too bad), but closer to the venue looks to be more $$. Still quite a lot of flights left, I'm looking to flying in maybe on the thursday and leaving monday afternoon/evening, but I'm flexable to work around other peoples plans. Tis rather $$, but it is a long weekend. Yea sorry about that - Ive confused matters greatly..
Im going to take a midday or early arvo flight out on the monday. Okay - after much rambling to myself..
Im booking QF761 heading home on monday 29th at 325pm. Anyone can feel free to join me. I reckon there should be other places around. There are backpackers all over the place. A lot depends on how people want to do rooms - whether people want their own rooms or we book out a dorm or something. Ill have a look on the weekend and try to find some places with descent room options maybe. There are a tonne in kings cross - but thats meant to be kinda.. seedy.. The backpackers I found all seemed to be fairly normal though - so most of the area might be okay.